Earlier today, Israel struck the T-4 military air base in Syria’s Homs Governorate. At least seven Iranians including a Colonel died in the attack, according to Iranian media outlets affiliated with the Islamic Revolutionary Guard Corps (IRGC), which set out to retract the articles before releasing full details. The latest incident follows yet another high-casualty gassing by the Syrian regime against civilian areas in the Damascene suburb of Douma. Israeli officials have said that they would not tolerate the IRGC’s military build up in Syria. The Guard Corps’ obsessive calls for Israel’s destruction and support for groups that fight it have made the Syrian build up a top security priority for Israel. At least 14 were reportedly killed in the Israeli strike, according to the Syrian Observatory for Human Rights. The state-affiliated Iranian media outlets retracted the articles after receiving orders from the IRGC. The acknowledgement has put the IRGC in a tough spot. It knows that it cannot respond in kind to Israel without a high risk of triggering a major war that would threaten its gains in Syria. Iranian media report that the Guard Corps colonel was a member of the Aerospace Force’s unmanned aerial vehicle (UAV) unit. His collar insignia corresponds with that description. 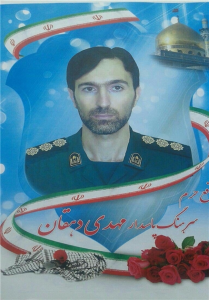 He appears to be the first confirmed IRGC UAV operator death in Syria. 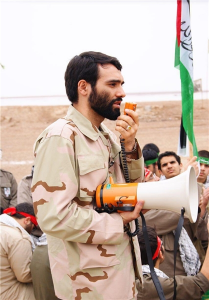 The acknowledgement and retraction raise questions about other instances in which the IRGC has suppressed information about fatalities in its foreign wars. Russia has released a statement saying that Israel did not notify it before the latest strike. Russian military personnel are known to operate in T-4. The US, which is mulling its own response to the latest gas attack, has said that Israel notified it before hand. In February, Israel struck targets in T-4 following an Iranian drone incursion into its airspace. Israel had said that one of the targets was the command truck that operated that drone, and released footage showing a missile hitting a target that fit that description. 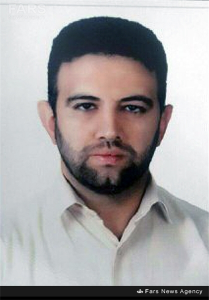 Israel has previously killed high-value Guard Corps and Lebanese Hezbollah targets in Syria including Qods Force Brigadier General Mohammad-Ali Allah-Dadi in Quneitra, Golan Heights, in 2015. 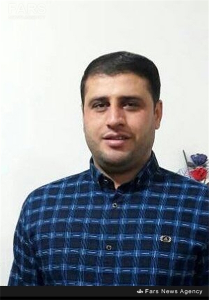 Update: IRGC-affiliated Tasnim News on April 10 officially raised from 4 to 7 the number of Iranian “advisers” killed in the Israeli airstrike and released all names. Their remains arrived in Tehran on the same day. 4 Iranian terrorists eliminated ! “yet another high-casualty gassing by the Syrian regime”. I would be interested in evidence who perpetrated the attacks. The previous attack that is referenced here, although immediately attributed to Assad, has been, to my knowledge, not attributed to Assad. That is at least the outcome of the official inquiry. Plus: what purpose would the use of a WMD have? For Assad it would be highly counterproductive (he has won and the only way to lose is to get Uncle Sam going); only to the “rebels” would the use of a WMD be useful. They might score a small win or they might score a massive win if the US goes to war. If the latter happens, the jihadis might turn the whole region into an even bigger mess than it already is. Can you guys write an article on this topic? Sounds political on the Israeli side. ToughGuy play to offset bribery. Same time, Iran has had two battalions in western Syria for years. Almost a third the size of the Hizb Allah force. They’re the gunners using the American 155mm howitzers for one. And with respect to chlorine going loose in eastern Damascus, we should know that the al-Qaeda affiliates have used chlorine for years. They built up stockpiles from agricultural sources. Why would anyone be surprised when a bombing hits one of these magazines? That’s happened repeatedly for years. And while we’re killing folks who busy themselves fighting al-Qaeda in western Syria, let’s consider the evidence. And what Trump hath wrought. D’oh. And that the Syrians would have to be complete idiots to dump chemical bombs on people. Gee, propaganda. No responses allowed ?